There really are more insulated travel coffee mugs than you could ever possibly take a close look at. I’ve tried to narrow down the category here for you to make things easier. If you are looking to buy a really great thermal travel mug then you’re sure to find something perfect for your needs on the following pages. As always I’ll start off with a couple best sellers to review followed by links to types of mugs. The BEST Travel Mugs by Category – This page lists all the best mugs for various uses. No one mug is going to be best for everything. This page should help you find the best insulated mug for whatever you need it for. Large Travel Mugs – If you’re like me you’re either drinking excellent espresso or slowly sipping on an oversized load of good coffee out of a large travel coffee mug. This page lists many of the excellent travel mug options for the oversized coffee drinker. 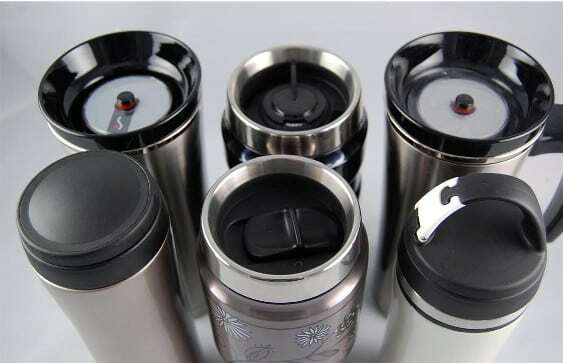 Small Travel Mugs – You don’t always need or want a large mug or even a normal sized travel mug. Sometimes a small or short mug is exactly what you need. Whether you’re sipping coffee slowly at a desk or at your couch or you are using a single-cup coffee maker these smaller insulated mugs may be just what you’re looking for. Travel Mugs To Fit Keurig Machines – Let’s face it, Keurig is great but no one wants to put 8-10 ounces of Keurig coffee in a 16-20 ounce mug. In fact many of the most common travel mugs don’t even fit the Keurig machines. Here I’ve identified many options for the Keurig machine that are sized right and will keep your coffee hot and out of your lap. Travel Mugs That Keep Coffee Hot For A Long Time – Unless you love gulping your coffee quickly you probably always face the problem of coffee going cold a little too fast for your liking. The mugs on this page may cost a bit more and may be a bit heavier or harder to clean but you are not going to have to think about cold coffee again. many of them keep your coffee hot or warm for the better part of an entire day. French Press Coffee Mugs & Cups – Instead of taking a french press with you everywhere you go being along a french press mug instead. These mugs make it easy to make good coffee and take it with anywhere you go. These not only are very useful to have on hand for trips or for your commute but they also make awesome and practical gifts for your coffee drinking friends and family. Glass Travel Mugs With Lids – If you don’t like using plastic if you can avoid it then this page should help you find a good selection of top of the line insulated glass travel mugs. All of these mugs use a bit of silicone but short of using stainless steel all the way through these mugs make for a great alternative. Also, take a look at the following pages for some closely related items. Unique Coffee Mugs – This is a selction of unique or interesting coffee mugs and cups, some of which are insulated travel mugs. Insulated Coffee Cups With Lids – If you want something resembling more of a standards coffee cup then these may be of interest to you. These mugs come with lids making them handy when you’re on the road although they may not be the best for travel. Insulated Travel Cups For Smoothies – Want something for your post-workout smoothie? These are travel mugs and cups which are geared for cold beverages and smoothies above all else. Make sure to take a look at the store for related shopping.